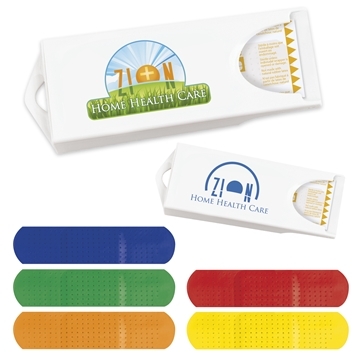 Great for safety and healthcare promotions. Bandages are not made with natural rubber latex. Materials: Case: Styrolux Plastic, Bandages: Not Made with Natural Rubber Latex. When others first viewed it they were impressed and thought we had spent a lot more than we actually did. Veronica has bent over backwards on two separate orders for us! She was excellent. I'm happy. Great value, will certainly be ordering again! Thank you for helping us look great! Another successful order this time, thanks AnyPromo!